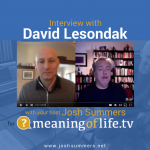 I had the great pleasure of speaking with David Lesondak about all things fascia. David has the great ability to explain challenging concepts in plain English that are easy to understand. If you do yoga, you’ll want to listen to what he has to say.